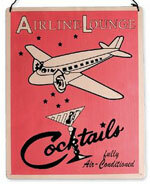 Fancy a retro cocktail hour? I think there's something very civilised, if a little Bondian, about getting dolled up for a fancy drink before dinner. To help you get into the spirit (see what I did there? ), hang this cute pink metal airline lounge sign (Rex £3.95), and pretend you're about to embark on a glamorous trip filled with exotic intrigue. I thought it was appropriate to start the new year with something sweet (did you overindulge during the festive season? I did). If you're going for the shabby chic look, or want a girly touch in the kitchen (hmm, that sounds ruder than it was meant to), these fairy cake/cupcake decorated items would be just the thing. 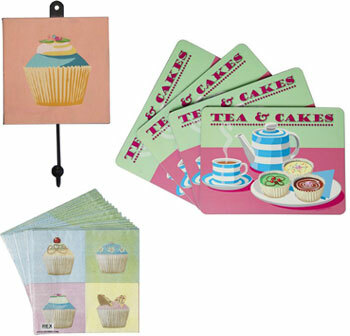 The hook comes in four different designs and is made of metal (£2.95), the cute 'tea & cakes' placemats are laminated for easy cleaning and cork-backed to protect your table (£8.95 a set of four), and if you want to go all out, how about using these paper napkins as well (£1.95 for a set of 20). It's not really the season to be talking about outdoor living, but while this floral table is designed to take on camping trips, it would also be useful as additional low coffee table space for indoor parties. You know what it's like: your friends are lounging around on floor cushions because you don't have enough seating and drinks get spilled because they're sat on the floor. Problem solved! 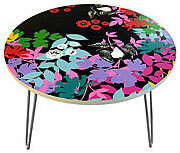 The table would also make a stylish child's table, especially if bedroom space is at a premium, as one assumes (though the site doesn't confirm), that the legs are folding. £25 from Paperchase and also available in a rectangular shape with butterflies or stripes. 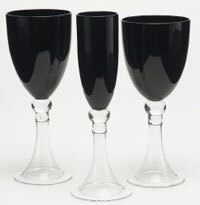 How wonderfully gothic these 'Moderno' glasses look, very sleek and simple, but incredibly opulent at the same time. You could go all out baroque style with decadent tableware and flowers, or quite minimalist with plain edgy white china and stark cutlery and this glassware would complement either look. The glasses are mouth-blown, so you'll probably need to wash them by hand, but being from the Pier, they're still keenly priced at £4 each. It's great being able to buy from small, independent designer-manufacturers. Through little online shops, you'll often discover new things that aren't available anywhere else, like these retro coasters from Truly Ace by designer Amanda Vlahakis. They come as a boxed set of four for £8 and are available in a striped design or the fabulous rounded design shown which makes me think of watermelons. They're cork-backed and suitable for hot or cold drinks. These substantial leather coasters from Roco Verre come in four colours: tan, chocolate brown, cherry red and black, so you can complement your decor or tableware. I really like the simple plain silver-coloured band and quality leather in a chunky but elegant design. They have a non-slip rubber base and they're ordered singly, so you can mix and match rather than having to go for a matched-colour set. They're £4.50 each from Contemporary Heaven.